Tubbataha Reef is the Philippines’ most celebrated dive site, a remote pair of submerged atolls only accessible by liveaboard and home to such a diverse array of marine creatures it’s a listed UNESCO World Heritage site. Here’s my report on my return to Tubbataha after a five year absence. 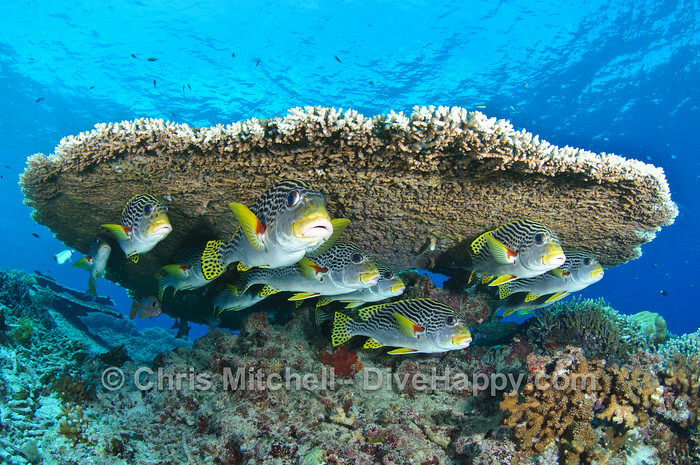 Hard to believe that’s it’s been five years since my first visit to the Philippines’ Tubbataha Reef back in 2007. This remote dive spot in the middle of the Sulu Sea is only accessible from March to June each year and the two huge atolls which make up the reef – like diving on drowned mountains – are so unique they’re a UNESCO World Heritage site. My previous trip (read the full 2007 Tubbataha Liveaboard writeup) had its share of variable weather – and we had the same problem this time, with initially beautiful conditions deteriorating into a persistent drizzle and grey skies for much of the time we were at Tubbataha. However, this was to be expected as this was the last trip of the season, departing Puerto Princesa on 9th June and, after spending 4 days at Tubbataha, making the transition to Cebu for the liveaboard’s next season exploring the Visayas. We were on board the large and quite comfortable Hans Christian Andersen. (Read my Hans Christian Andersen liveaboard review for more details on the boat itself). Despite the weather, we had an excellent few days at Tubbataha thanks to some spectacular sightings of huge schools of jacks circling over the top of the reef, inquisitive turtles fearlessly coming to investigate out dive groups, numerous sharks spotted cruising along Tubbataha’s walls and a surprise appearance by several manta rays, who returned to their cleaning station on multiple occasions letting everyone get to see them. 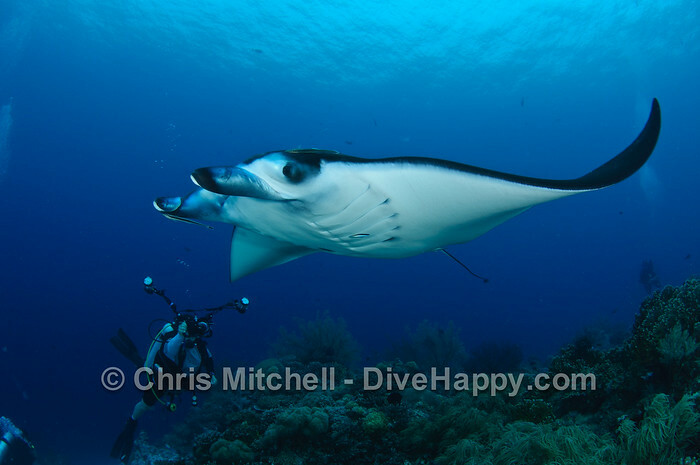 Mantas are always present at Tubbataha but it’s not a given that every trip will see them – indeed, I’d seen very little big stuff on my previous trip. So seeing the manta rays was a real treat and caused a buzz on the boat. Certainly the reefs in general seemed a lot more active than I remember – again, probably just the luck of the draw compared to my previous trip. Besides the jacks, there were several huge schools of chevron barracuda sighted too on numerous occasions. Where there wasn’t big stuff to see, the dramatic topography of Tubbataha provided plenty of entertainment on its own. Visibility throughout the trip was stunning, with 30 metres easily the standard and looking down the wall into the depths seeming to go on a lot longer. As I noted in my previous Tubbataha trip report, the sheer epic scale of the vertical walls of Tubbataha’s atolls combined with the viz and the profusion of sea fans to be found on most of the dive sites makes for a fascinating underwater environment. There are clouds of trigger damsel and bannerfish scattered amongst huge barrel sponges and a carpet of smaller corals that cling to the top and sides of Tubbataha’s walls. To be fair, if you’re not a fan of walls, you’re going to get a bit fed up as that is basically all there is here, along with some shallow topside reefs and the Malaya wreck, the rusted remains of which sit in less than five metros and provides a home for many docile snappers. Otherwise, most dives involve heading over the edge of the reef and scanning the blue both below and beyond while feeling very, very small in such a massive underwater seascape. After four days of diving at Tubbataha, we headed towards Cebu, with two more days of diving scheduled at the islands of Calusa and Cagayancillo. Calusa was very quiet compared to Tubbataha’s smorgasbord of marine life, and while it did have some beautiful coral patches, it was a little bit of a comedown. Nearby Cagayancillo was more interesting, with increasingly urgent currents around an underwater point bringing in big schools of barracuda, humphead parrotfish and jacks. Best of all of the three dives we did was exploring a wall with numerous dramatic overhangs, including a half tunnel eroded into the rock and filled with human sized fans along its length. The trip concludes with a full day’s sailing (and no diving) which gives time for dive gear to dry out and to relax – the boat passes Apo Island and Dauin, and it’s a shame in a way the schedule can’t be tweaked to spend less time at Calusa and more time Dauin, one of the best muck diving areas in the Philippines. The following morning transfers are made by speedboat to the shore and then taxi to Cebu airport. Tubbataha is a unique destination and getting to see Calusa and Cagayancillo as well for the same price as a normal 4 day Tubbataha liveaboard is a nice bonus – if you don’t mind the possibility of rainy weather, doing a transition trip could well provide the best way to see Tubbataha.